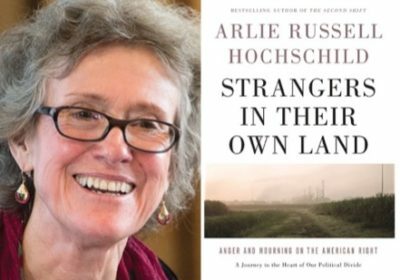 Q&A: ARLIE HOCHSCHILD, Strangers in Their Own Land: Anger & Mourning on the American Right. What new story can make Americans yearn for the future more than the past? Okay. Hello, I’m Terrence McNally and welcome to Free Forum: A World That Just Might Work. My question is, how do we do that in 2018? That day, a bit over a year ago, I wrote the following: “Passion to return to a simpler past drove enough voters to the polls in swing states to decide the 2016 presidential election. How can we engage their emotions in a more positive forward-looking or progressive direction? When you offer people the preservation of the present, or the return to the past, when you offer to postpone or eliminate change, as Trump does, your audience has an experience to draw from. And for many, an inflated or idealized vision of the past has a clear advantage over the yet-to-be-experienced future, the uncertainty of that future. Ever since that day, I’ve been wanting to talk with today’s guest, Arlie Hochschild, professor emerita of sociology at UC Berkeley, and author most recently of Strangers in Their Own Land: Anger and Mourning on the American Right. For over 30 years, her inventive and provocative and useful insights about contemporary work and family have grown out of research. She’s done the interviews, she’s spent time with the people, and she has long focused on the human emotions which underlie our moral beliefs, practices and social lives. Welcome, Arlie Hochschild. You laughed and said that, in fact, that would be your first advice, wouldn’t it? I think it would, I think it would. And to not be frightened to sit down and respectfully listen to people that you know going in are going to be different from you in their outlook, their premises. But, to pick up the challenge you just posed… After you’ve listened, what kind of a vision could one put forward. The people I came to know in researching Strangers in Their Own Land over five years in the center of the petrochemical industry in Louisiana, very right wing, everybody went for Trump, I got the feeling that they would be very interested in a vision which, for one thing, is unifying. How much technology do you use? Email, texting, facebook, twitter, second life, etc. How's it working for you? Has it freed you up, given you more time, or has it added new demands to your life that actually make you feel you have less time? If you're using social media regularly, do you feel more connected with your friends and family or less? Clinical psychologist SHERRY TURKLE has been studying our relationship with technology for most of her career, and has written several books about what she's experienced and learned. Of her newest, ALONE TOGETHER, she has said, "This is a book of repentance. I have been studying computers and people for thirty years. I didn't see several important things. I got some important things wrong." I was already interested in talking to her, but that really grabbed my attention. I'm interested in people, maybe especially experts, who are willing to change their minds. Turkle writes: "Technology promises to let us do anything from anywhere with anyone. But it also drains us as we try to do everything everywhere. We begin to feel overwhelmed and depleted by the lives technology makes possible. We may be free to work from anywhere, but we are also prone to being lonely everywhere. In a surprising twist, relentless connection leads to a new solitude. We turn to new technology to fill the void,but as technology ramps up, our emotional lives ramp down." Paul Gilding says it’s time to stop worrying about climate change; global crisis is no longer avoidable. He believes the Great Disruption started in 2008, as spiking food and oil prices signaled the end of Economic Growth 1.0 based on consumption and waste. Coming decades will see loss, suffering and conflict, but he believes the crisis offers us both an unmatched business opportunity as old industries collapse to be replaced by new ones, and a chance to replace our addiction to growth with an ethic of sustainability. Gilding has been involved with activist campaigns on a wide variety of issues and served as executive director of Greenpeace Australia and Greenpeace International. He founded Ecos Corporation in 1995, consulting to some of the world’s largest corporations on issues of sustainability until its sale in 2008. 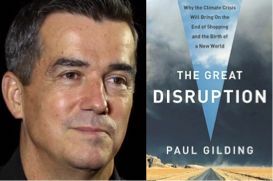 Gilding’s first book is The Great Disruption: Why the Climate Crisis Will Bring on the End of Shopping and the Birth of a New World. Terrence McNally: Could you briefly talk about your path to the work you do today? Paul Gilding: I started as an activist really very young. Age 14, 15, I got involved in a variety of issues and went on from there through 19 years of traditional activism, more on the human social side than the environmental side. Then through the late ’70s to early ’80s, I got involved in the anti-nuclear weapons and nuclear war movement. That led to a greater understanding of environmental issues, which then led to Greenpeace and very focused direct-action campaigns against corporate pollution. I ended up head of Greenpeace International. I left there in the mid ’90s, focused on the role of markets and companies. How could we mobilize the power of markets as a force for good in this area? For the next 15 years I focused on that question, working in the corporate sector, running two companies that I built. Really trying to see if you can drive change through business — from the point of view of self-interest, recognizing that business is driven by making money. That’s their core metric. Then about four or five years ago, I came to the conclusion that we really had done our best in the environmental and social change movements, but the ecological and system pressures we’d brought to bear on the global ecosystem were now in full flight. Change is going to be unstoppable. Tech futurist and game designer Jane McGonigle on how computer games can help the fight against AIDS, heal disabilities, increase optimism, and make us better people. There are 183 million active computer game players in the United States. The average young person will spend 10,000 hours gaming by the age of 21. More than 5 million “extreme” gamers in the U.S. play an average of 45 hours a week. Videogames took in about $15.5 billion last year. Most of what you hear about this phenomenon is doom and gloom – people becoming addicted, isolated and socially inept. Some worry that gaming is pulling people away from productive work, fulfilling relationships and real life. But game designer Jane McGonigal says the reason for the mass exodus to virtual worlds is that videogames are increasingly fulfilling genuine human needs. In a very popular TED talk — and in her first book, Reality Is Broken, just out in paperback – she suggests we can use the lessons of game design to fix what is wrong with the real world. Terrence McNally interviewed McGonigal for AlterNet by phone from her home in the San Francisco Bay Area. Terrence McNally: I see four strands in what I’ve read about you and your work: Buddhism, games, positive psychology, and entrepreneurism. How do you describe your path? NYT business reporter Gretchen Morgensen discusses her new book and the corruption of the mortgage lending industry. July 26, 2011 | Gretchen Morgensen was awarded the Pulitzer Prize in 2002 for her “trenchant and incisive” coverage of Wall Street and has been on that beat ever since. Her new book, Reckless Endangerment: How Outsized Ambition, Greed, and Corruption Led to Economic Armageddon (written with Joshua Rosner), lays out the toxic interplay between Washington, Wall Street and corrupt mortgage lenders that led to the meltdown. It examines how the watchdogs who were supposed to protect us from financial harm were actually complicit in creating the crisis. Gretchen Morgenson is a business reporter and columnist at the New York Times, where she also serves as assistant business and financial editor. Prior to joining the Times in 1998, she worked as a broker at Dean Witter in the 1980s, and as a reporter at Forbes, Worth, and Money magazines. Authors Phil Goldberg and Greg Epstein share their provocative views on why a quarter of Americans now call themselves agnostic, atheist or nonreligious. May 10, 2011 | Currently more than one billion people around the world define themselves as agnostic, atheist or nonreligious — including 15 percent of Americans. Perhaps more striking, “nonreligious” is not only the fastest growing religious preference in the U.S., but also the only one to increase its percentage in every state over the past generation. Phil Goldberg and Greg Epstein have provocative perspectives on who these people are, what they believe, and how they arrived at their worldviews and their moral codes. In February, 1968, the Beatles went to India for an extended stay with their new guru, Maharishi Mahesh Yogi. It may have been the most momentous spiritual retreat since Jesus spent those 40 days in the wilderness. Tax journalist David Cay Johnston explains what’s so rotten about our taxation system and the distribution of wealth in this country. April 20, 2011 | When I was growing up, people joked about how much they hated taxes, but they paid them, and we had a solid middle-class society. Real wages rose from WWII through 1973. Despite profits of $14.2 billion — $5.1 billion from its operations in the United States — General Electric, the nation’s largest corporation, did not have to pay any U.S. taxes last year. Its CEO, Jeffrey Immelt, recently replaced Paul Volcker as leader of President Obama’s Economic Recovery Advisory Board as its name was changed to the Council on Jobs and Competitiveness. David Cay Johnston worked as an investigative reporter for several newspapers, including the Los Angeles Times from 1976 to 1988, and the New York Times from 1995-2008 where he won a Pulitzer Prize for his innovative coverage of our tax system. He now teaches at Syracuse University College of Law and Whitman School of Management and writes a column at Tax.com. He is the author of two bestsellers, Perfectly Legal and Free Lunch. His next book, The Fine Print, will be published later this year. 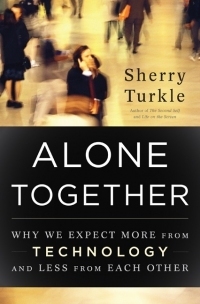 Author Sherry Turkle on her new book arguing that relentless connection through technology leads to a new solitude. Sherry Turkle is Professor of the Social Studies of Science and Technology at MIT and founder and director of the MIT Initiative on Technology and Self. A licensed clinical psychologist, Sherry is the author of several books including The Second Self: Computers and the Human Spirit, and Life on the Screen: Identity in the Age of the Internet. Alone Together completes a trilogy. Germans have six weeks of federally mandated vacation, free university tuition, and nursing care. Why the US pales in comparison. October 14, 2010 | While the bad news of the Euro crisis makes headlines in the US, we hear next to nothing about a quiet revolution in Europe. The European Union, 27 member nations with a half billion people, has become the largest, wealthiest trading bloc in the world, producing nearly a third of the world’s economy — nearly as large as the US and China combined. Europe has more Fortune 500 companies than either the US, China or Japan. European nations spend far less than the United States for universal healthcare rated by the World Health Organization as the best in the world, even as U.S. health care is ranked 37th. Europe leads in confronting global climate change with renewable energy technologies, creating hundreds of thousands of new jobs in the process. Europe is twice as energy efficient as the US and their ecological “footprint” (the amount of the earth’s capacity that a population consumes) is about half that of the United States for the same standard of living. Unemployment in the US is widespread and becoming chronic, but when Americans have jobs, we work much longer hours than our peers in Europe. Before the recession, Americans were working 1,804 hours per year versus 1,436 hours for Germans — the equivalent of nine extra 40-hour weeks per year. In his new book, Were You Born on the Wrong Continent?, Thomas Geoghegan makes a strong case that European social democracies — particularly Germany — have some lessons and models that might make life a lot more livable. Germans have six weeks of federally mandated vacation, free university tuition, and nursing care. But you’ve heard the arguments for years about how those wussy Europeans can’t compete in a global economy. You’ve heard that so many times, you might believe it. But like so many things, the media repeats endlessly, it’s just not true. Thomas Geoghegan, a graduate of Harvard and Harvard Law School, is a labor lawyer with Despres, Schwartz and Geoghegan in Chicago. He has been a staff writer and contributing writer to The New Republic, and his work has appeared in many other journals. Geoghagen ran unsuccessfully in the Democratic Congressional primary to succeed Rahm Emanuel, and is the author of six books including Whose Side Are You on, The Secret Lives of Citizens, and, most recently, Were You Born on the Wrong Continent? For more than 50 years, Washington has subscribed to the absurd notion that America can police the world with military action. All we’ve managed to do is bankrupt our country.